Try as hard as they did, Alter Bridge simply couldn't shake off the spectre of Creed with their 2004 debut release One Day Remains. Although Myles Kennedy (Former vocalist for alternative rock outfit The Mayfield Four) had replaced Scott Strapp, Alter Bridge's debut still stuck closely to the winning formula that Creed reproduced repeatedly over their three album history. That was three years ago. Within that time, the Atlanta based heavy rock outfit (Who also comprise of guitarist/backing vocalist Mark Tremonti, bassist Brian Marshall and drummer Scott Phillips) have changed labels after splitting with Wind-Up Records to sign with Universal Republic, written together as a four-piece for the first time (With Kennedy also contributing on guitar) and made the album they wanted to make, without any of the said outside influences. And the results on the band's sophomore effort Blackbird speaks for themselves. 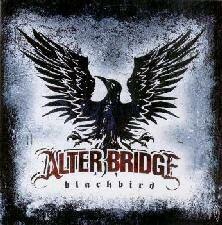 It's clear from the opening track Ties That Bind that Alter Bridge aren't about to repeat the mistakes of the past. Alongside the follow up track Come To Life, the band flex their metallic muscle with huge guitar riffs, strong vocal melodies that sound like they actually fit within the context of the musical accompaniment and solos that really allow Tremonti to prove himself as a lead guitarist rather than just a rhythm player. Both songs are undoubtedly the heaviest tracks ever penned from the group, and fit Alter Bridge's dual guitar sound, and Kennedy's vocals sound perfectly. Although starting out with acoustic guitars, the slower paced Brand New Start gradually picks up power along the way, with Kennedy's vocals projecting plenty of emotion. The single Rise Today, and Before Tomorrow Comes are both tracks that utilize a similar approach before launching into a full on anthem like choruses, yet on tracks such as One By One, White Knuckles and We Don't Care At All, Alter Bridge reinstate their heavy and aggressive approach, without losing any of their melodic appeal. However, it's the lengthy centerpiece Blackbird that really proves to be one of the album's more stunning efforts. Alternating between acoustic passages and all out heaviness, its Kennedy's emotive performance throughout and Tremonti's equally impressive shred work towards the end that really makes this song stand out as one of the band's best yet. The remainder of the album is no less impressive, with a mix of acoustic/slower, moodier numbers (Watch Over Me and Wayward One), and mid-paced heavy rockers (Break Me Down, Buried Alive and Coming Home) to maintain the quality of the album right through to the very end. With One Day Remains, Alter Bridge were simply preaching to the (Creed) converted. While there's nothing wrong with that, it certainly didn't win them any new fans. On Blackbird, the band has risked everything to do the complete opposite. While in the short term, it'll disappoint some fans, in the long run, it'll prove that there's more merit in the members musical abilities than just churning out another Creed album with a more convincing vocalist.